I am not at all interested in generalised sorting of icons on my desktop or inside fences. I like to sort the icons according to my own management system and not have them altered and changed. Not only are the icons sorted inside fences but also the icons on my desktop but now sorted in some way other than by my place in them in certain positions. I want to organise the icons according to my own criteria and have them kept in that manually adjusted state. I require this condition in the fences as well as on the desktop. How do I arrive at this outcome? You can try the Custom Rules. All useless for my needs I am afraid. There is no option to turn off auto organising of some sort. I want to organise them myself and have them stay where I place them. If this feature is not available in fences I will go back to the open source solution that I was using. are you telling me that i cannot turn off the sorting to allow me to individualy arrange the icons within the fences? I too would like an option to turn off auto sorting so icons stay where I put them. I have to believe there are others who would like this option as well. I also don't understand why some icons move where they do. 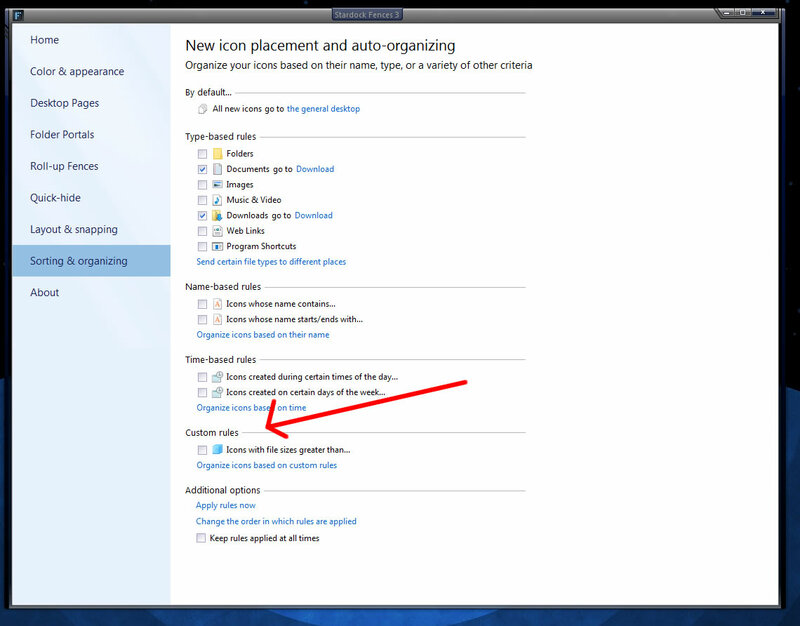 For example the Recycle Bin insist on being in the upper left corner of the folders fence when there are no rules created.